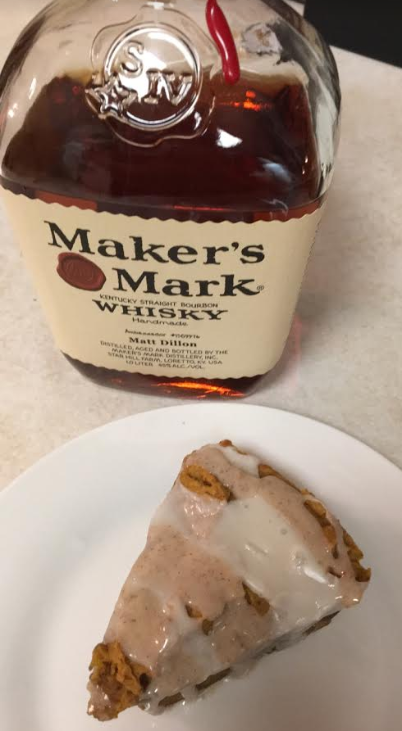 I’m a firm believer that bourbon + dessert is always a good combination. With that being said, I’m also now a firm believer that you should always follow the recipe on your first crack at a new Pinterest find. Here’s the thing… I wanted to make pumpkin scones. The recipe I found had a bourbon glaze… This, my friends, is what we call delicious destiny. Here is where my Pinterest semi-fail comes in: I didn’t trust the recipe and ended up with a dense scone-shaped cake, with an epic bourbon-maple glaze. Is it good? Yeah, it’s okay. That frosting though. Should I have followed the recipe? Yes. 100% yes. Will you post the recipe fail vs real? See below friends. Do your cake-things look pretty? Absolutely not. Preheat oven to 350. Mix the pumpkin, egg, bourbon, cream, and maple syrup together. When well mixed, slowly add in your flour. Mix well. Add in spices and butter. I left visible chunks of butter… because yum. Place into a greased 8×8 pan and bake for 20-30 minutes. Once cool – GLAZE. Mix the glaze ingredients (separate bowls for each type). Real talk – you MAY want to eat this by the spoonfuls. Make extra!